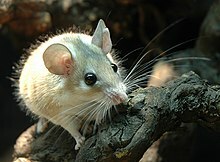 The suborder Myomorpha contains 1,137 species of mouse-like rodents, nearly a quarter of all mammal species. Included are mice, rats, gerbils, hamsters, lemmings, and voles. They are grouped according to the structure of their jaws and molar teeth. They are characterized by their myomorphous zygomasseteric system, which means that both their medial and lateral masseter muscles are displaced forward, making them adept at gnawing. As in the hystricognathous rodents, the medial masseter muscle goes through the eye socket, a feature unique among mammals. Myomorphs are found worldwide (apart from Antarctica) in almost all land habitats. They are usually nocturnal seed-eaters. Most myomorph species belong to the superfamily Muroidea: (hamsters, voles, lemmings, true mice, true rats, and gerbils). This page was last edited on 20 December 2018, at 00:02 (UTC).